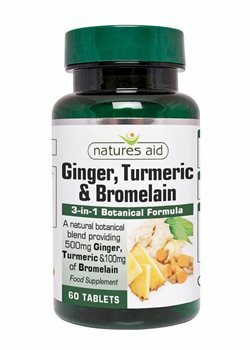 Natures Aid Ginger, Turmeric and Bromelain tablets contains, Ginger root extract, equivalent to 500mg dried root, Turmeric root extract, equivalent to 500mg dried root and Bromelain 100mg. standardised to provide - 4mg of gingerols. Containing 2000 Gelatine Digestive Units (GDUs) per gram of Bromelain. This product is free from artificial flavours, colours & preservatives, lactose, yeast & gluten.